The Chimney NYC is pleased to present Incantations: The Modern Cave, a group exhibition exploring the trace: human, natural or industrial. The ones left by our species as a testimony of our passage on earth, those created by artists sharing their perspective on the world, and others oscillating between natural and man-made, organic and manufactured. The exhibition explores the primal desire of contemporary artists to create in this geological era commonly referred as the age of the Anthropocene. The red industrial bricks, blocked cimented windows, metal beams and condemned chimney make of The Chimney a Modern cave. Six artists working across various mediums have left their own trace. Incantations: The Modern Cave both reveals and resolves the inherent conflict of an increasing industrial landscape in which nature strives to survive. 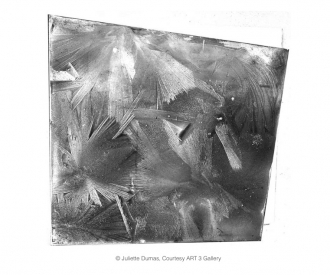 Juliette Dumas directly investigates the interrelationship between the natural and human realm. In her Frozen Plates series, she pours wheat paste, ink and varnish on metal plates on days where temperature drops. Collaborating with the cold, Dumas captures the invisible marks of its ghostly presence and reveals the unseen to the eye. Her work questions environmental degradation and humans’ attempt to control it.